Seek medical attention if you have a rodent problem and become ill. Salmonellosis is a salmonella-like infection that is found in rat droppings. Murine typhus is the spread of lice or fleas that result into symptoms, such as rashes and abdominal pains. Rat-bite fever comes from being in contact with the urine and secretions from the mouth, nose and eye of the infected animal. The symptoms are chills, fever, rashes and severe headaches. You can purchase traps at home improvement stores such as Home Depot, OSH and Lowes. You can buy pest-resistant storage contains at Target, Walmart or K-Mart. Pack rats are rodents that tend to collect shiny objects, such as spoons, forks, gum wrappers, jewelry and pieces of mirrors. 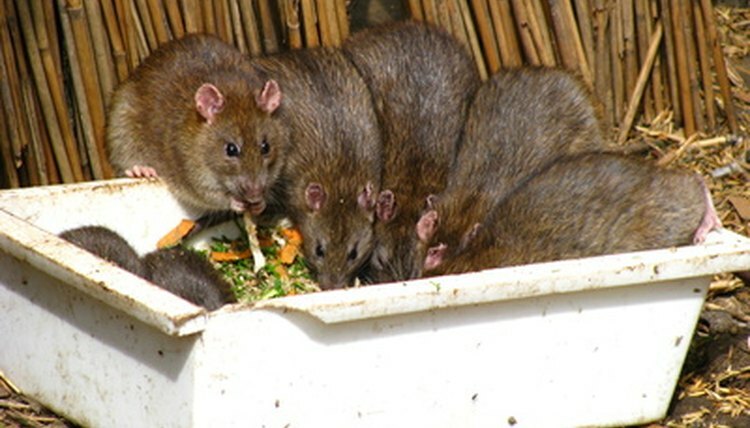 Pack rats, which tend to infest kitchens, can carry and transmit diseases such as rat-bite fever, salmonellosis and murine typhus. Catching these pesky rodents takes patience, the ability to outsmart the animals and practice future preventative measures. Stay up late one night. Rodents, such as pack rats, are nocturnal. Listen at night for scurrying and scuffling sounds in the walls and cabinets to pinpoint where they are. Purchase rat traps. Trustworthy live traps, such as the Mouse Master, the Mini Cat, the Safeguard Rat and Squirrel Trap and the Multi-Catch Mouse Trap can catch rats without killing it. Place rat-friendly traps near the scurrying sounds. Rat traps aligned with food, such as bread or cheese, can help you attract and catch the pack rat and set it free away from your house. Purchase dry plaster and a silicone sealant. Seal off cracks, gaps and holes in your walls or foundation. This will keep rats out of your house. Clean your infested areas. Dispose of the crumbs in your cabinet, on your floor and around trashcans. Keep your food in pest-resistant storage containers. Maintain your yard and trees. Pick up all fallen fruit and plant trimmings regularly so you can see the ground and look for tunnels. Plants and fruit attract rodents because they provide shelter and food, respectively.